A master of figurative, realist art, Ken Orton's ultra lifelike artworks have taken him around the globe. His images of glass vessels not only highlight the intricacies of his paintwork but the variety of enchanting ways in which light interacts with forms. The bottles and jars which often figure in Orton's work can be seen as stand-ins for other man made constructions, such as city skylines, giving the viewer a more intimate perspective on the way we see the world around us. Explore our collection of Ken Orton paintings here. Born in 1951 in Yardley, Birmingham, Ken Orton dedicated his life to painting from an early age. One of seven children, Orton grew up as part of an innately artistic family, and much of his inspiration came from his brother Bill. After finishing comprehensive school in Birmingham, he continued his studies in art at Birmingham College of Art, before attending art college in Manchester, leading to work as an art teacher in his hometown. After six years teaching in Birmingham, in 1979 Orton took up an offer to move to Mallorca in Spain, taking charge of the arts programme at the island's Joan Miro Centro de Arte of the Baleares International School, where he remained for two decades. Forming a close bond with his students, Orton taught colour theory, composition and structure to his classes, providing them with a firm grounding which led many of them to their own successes in the arts. Orton moved to America in 1999, settling down in the Catskills area of New York State. One day not long after his move, Orton found a vast assortment of bottles and cases of mason jars by chance in the cellar of his new home. Studying the different way light reflected on the jars' embossed lettering compared with their smoother curved surfaces, he recalled one of the fundamental areas of his art lessons: During his time as an arts instructor, Orton found himself using glass vessels as a way of teaching his students how to draw circular forms in perspective. Merging this chance discovery with the influence of his peer Steve Smulka, Orton set out the overarching visual and technical themes of his work to date. 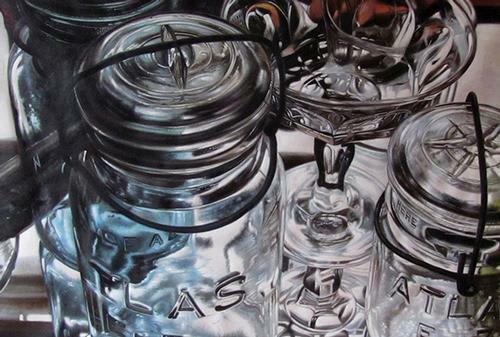 He does not see himself as a photorealist, as such, preferring to think of his work in a "more academic" manner; Orton views the soft focusses and blurry colour fields he lays out within his work as "illusionary poems rather than an inventory of seen objects". Since the turn of the millennium, Orton's work began to be exhibited around the world, and he has had one-man shows of his artwork across Europe and the United States. He has also won the prestigious Washington Square Painting Prize, awarded to him in his adopted home of New York. Orton has also acted as an expert witness in the authentication of artworks, run galleries, and curated exhibitions. Outside of his art, Orton is also a devoted acolyte of the blues, and the Americophilic tendencies which led him to New York have also seen him make visits to the homes and honky tonks where his heroes used to live and work. His love of the blues has also been expressed as part of a number of bands, some of which he even formed with his students during his time in Mallorca. Orton continues to live in the Catskill Mountains, spending his winters in Florida, where he paints and, when satellite television allows it, watches Aston Villa games.